Even a bad back couldn't slow him down. Virender Sehwag batted like the nearby Arabian Sea in high tide - and when Sri Lanka tried to plug one hole, he rushed in through the other. He ended the day 16 short of becoming the first man to score three triple-centuries in the history of Test cricket but he'd already broken a string of records - the most double-centuries by an Indian, the second-highest scorer of 250-plus scores, the most runs by an Indian in a day (breaking his own record) - and given India enough time to push for a huge lead and then an innings win. All this despite starting the innings more than half an hour into the day. 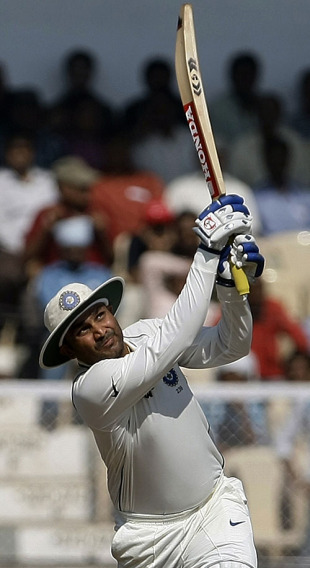 Sehwag's was no monotonous power hitting but a delightful and clever exercise in finding gaps through defensive fields for most of the innings. Think Twenty20 highlights, but with the batsman playing lovely inside-out chips, straight lofts, reverse-sweeps to beat leg-side fields, flicks to beat off-side fields. Part of Sehwag would have felt for Sri Lanka (he says he feels sorry for the bowlers when he bats this well); more helpless bowling units would be hard to find. Sri Lanka could manage only four maidens between them out of 79 painful overs. M Vijay, playing his second Test because of Gautam Gambhir's absence, and Rahul Dravid scored 149 runs between them in 242 balls, but they were distant second fiddles. Nothing, though, told the story like Muttiah Muralitharan's plight. He was the last of the specialist bowlers tried, in the last over before lunch. By that time Sehwag had already reached his fifty and India had scored 85 in 17 overs. He bowled the first ball with a long-on in place and never looked like creating any opportunity in 19 succeeding overs. When Murali started his ninth over, Sehwag had reached 110 off 107 deliveries, Vijay 83 off 111, and India 198 in 36 overs. Murali bowled a doosra, Sehwag took his front foot out of the line, and lofted it over extra cover. The next ball Murali shortened the length, Sehwag read the doosra again, went back into the crease and presented the deadest of defences. Murali dropped his wrists in exasperation and went back to brood over figures of 9-0-56-0, which would only become worse. He has now bowled 69 consecutive overs without a maiden. And as the innings progressed, and the field spread, Sehwag's scoring kept getting faster and faster. Hard as it is to believe, Sehwag had scored just 15 runs off the first 31 balls he faced. And then he opened up, cutting Chanaka Welegedara for a four, and lofting Rangana Herath for six in his first over. Since then, the longest he went without a boundary was 12 balls - moving from 166 to 172 - and showing Welegedara, the pick of Sri Lankan bowlers, a semblance of respect. By then Sehwag had seemed to recover from the back trouble that threatened to pull him down just before tea. He was seen leaning on the bat, falling over, and holding onto his back while taking singles. By tea he had reached 151 off 131 deliveries - the last 50 in 30 balls. If Sri Lanka were hoping for relief because of the back, they had another hope coming. To the first ball after tea, bowled by Herath from over the wicket with a leg-side field, and pitching well outside leg stump, Sehwag stepped out, made room and chipped over extra cover. Not one single did he turn down, not one double was compromised because of tiredness. If anybody was tired, it was the fielders. Angelo Mathews, one of the more athletic fielders, couldn't bend down in time and gave away a boundary in the 57th over. The ball had already been beaten out of shape by then. It was the second back-to-back boundary of that over. Sehwag leg-glanced the next delivery for another four, flicked the next and scampered through for two, and lobbed the next one to midwicket boundary to move from 184 to 202 in five deliveries. With both Vijay and Dravid batting solidly around Sehwag, Sri Lanka had forgotten what an edge looked like. In the 71st over, with Sehwag on 264, they finally saw one. Mathews bowled a slower one, and if you had seen how Sehwag had batted the whole day before that, like a religious believer you would say he hung his bat out and let the ball hit the edge so that it could go fine of third man for four. In the next over, Murali drew an edge that landed safe. In the next, Tillakaratne Dilshan got one that Mahela Jayawardene couldn't hang onto. It could be argued that no sane man would have been expecting an edge by then. Sehwag did slow down after that edge and as stumps approached but as a parting shot he crashed Dilshan through covers for his 40th four, to go with seven sixes. That's when Dravid came in, and took the majority of the strike till close of play. A fair time, then, to acknowledge Vijay, who at some other time would have been the story of the day. But when Sehwag bats like he did, you feel sorry for the bowlers, put the other batsmen in the footnote, and move on.